Most of use might have used Google Analytics for whatever reasons. Google Analytics could help us to learn about where our visitors come from and how they interact with our site. This service is brought online by Google for free. Ever wonder if you could view your Google Analytics results at your desktop? Yes, it can be done by using a software developed by Nicolas, called Google Analytics AIR. It was built under the Adobe AIR platform. 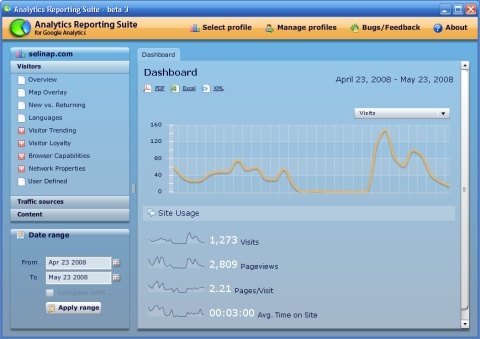 However, you still need to have the Google Analytics account in order to use this software. 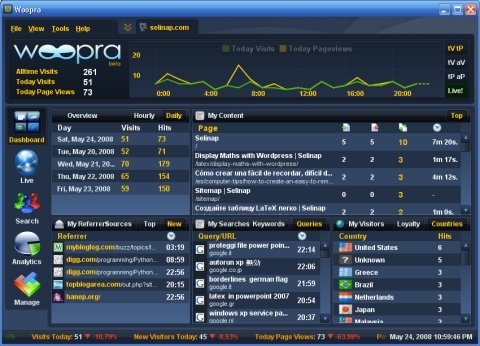 The second desktop Web analytics software is by Woopra. The platform used is Java, and is developed by Woopra. Although Woopra is currently in it's beta stage, don't under estimated it. It can even gives you live report, i.e. how many users are currently visiting your site. In order to use this software, you need to have an account with Woopra. In my humble opinion, Woopra is better than Google Analytics, especially the reporting style. What about you? Slow sikit le. Sebab tu kita letak di bawah sekali, sebelum kita tutup tag body.